Hardware - detailed information about the Raspberry Pi boards. Hardware History - guide to the Raspberry Pi models. Low-level Peripherals - using the GPIO and other connectors. 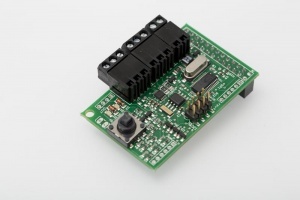 Expansion Boards - GPIO plug-in boards providing additional functionality. Screens - attaching a screen to the Raspberry Pi. Cases - lots of nice cases to protect the Raspberry Pi. Other Peripherals - all sorts of peripherals used with the Raspberry Pi. The Rpi GPIO (General Purpose Input/Output) pins are exposed, that means that expansion boards are able to talk directly to the CPU. 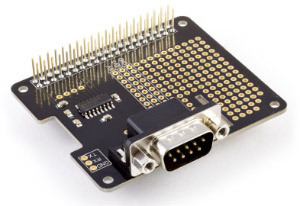 The DSI connector will allow low-level interfacing with LCDs and other displays. The CSI connector will allow camera modules to be added in future. See also Comparison of power supply & management hardware. 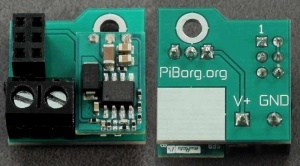 BattBorg is a power converter for your Raspberry Pi which allows you to power the Raspberry Pi off batteries. It will work with most batteries/battery packs that are between 7-36V so it's great for 12V car batteries, 8xAA battery packs, and so on. Perfect for autonomous robot projects where using a USB charger is not an option. This is a DC to DC switched mode power supply, another great add on board in Meltwater's range. It comes as a kit of parts, ready to be soldered together. This can supply a 5 volt output to a Raspberry Pi from an input of anywhere from 7 to 40 volts! Testing has shown that the unit is around 80% efficient, where a comparable linear regulator (such as LM350T) was measured under 50% (based on a quick test). The Pi Supply Switch is an "intelligent" power management device for the Raspberry Pi made by Pi Supply. This add on board has hard on/off switches as well as a soft shutdown switch, which initiates a safe shutdown using a simple Python script. It allows you to cycle power on the Raspberry Pi without plugging and unplugging either your "wall-wart" power supply, or the micro-USB plug input to your Pi. It includes an LED status indicator, and 3 mounting holes for easy use in any project you have in mind. It needs only one GPIO pin to operate, with the option of using a second GPIO pin to add the safe shutdown functionality. It is an Open Source project, and comes with free stickers and a free noodle USB cable to connect to your Pi. The Pi Supply was funded using the crowdfunding site, Kickstarter. The PowerPi is a flexible power supply and control board. It can power the Raspberry Pi from a 4-14VDC source or a single-cell Lithium-Ion battery. It has integrated battery charging, switch-over, and monitoring. 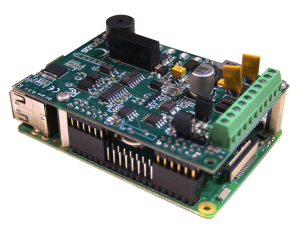 The AVR power supervisor allows the Pi to be powered on and off autonomously and also provides RTC and watchdog functionality. The RemotePi Board is an intelligent infrared remote controlled power switch add-on board for the Raspberry Pi2, B, B+, A+. It allows to switch power on and off using any button (configurable in learning mode) of an existing standard IR remote. Power is only cut after notifying the OS and giving it time to shut-down. It is mainly intended to remote control (using LIRC) and power off/on a mediacenter system. i.e OpenELEC, Raspbmc, XBian, RasPlex, Raspbian. 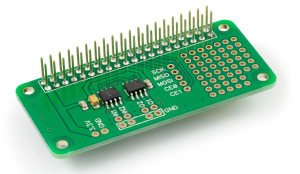 The board is compatible to simple GPIO IR receiver and piggy backs onto the Raspberry Pi, no soldering required. For more information click here. Strato Pi UPS by Sfera Labs is a professional expansion board that enhances the Raspberry Pi with several hardware features to make it suitable for use in professional applications where reliability and service continuity are key requirements. Strato Pi complies with CE directives for EMC, Electrical Safety, Emission and RoHS. 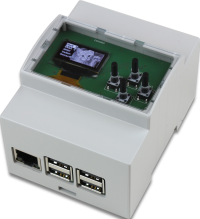 It is also available in the Server version pre-assembled in a standard 4 modules DIN rail case together with a Raspberry Pi 3 Model B. The UPS PIco is an advanced uninterruptible power supply for the Raspberry Pi® that adds a wealth of innovative power back-up functionality and development features to the innovative microcomputer! The standard UPS PIco is equipped with a 300mAh LiPO battery specially designed to enable safe shutdown during a power cut. The UPS PIco is powered and the battery pack intelligently charged via the GPIO pins on the Raspberry Pi®, so no additional cabling or power supply is required. 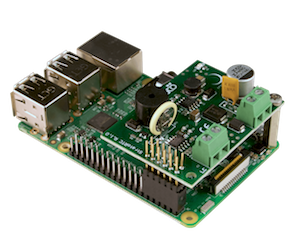 The UPS PIco is designed to be 100% compliant with HAT standards for the Raspberry Pi® B+ and A+, and is mechanically compatible with the original Raspberry Pi® models A and B when an extension header is used. In addition to this, because the UPS Pico requires no external powering and fits within the footprint of the Raspberry Pi®, it is compatible with most cases. The UPS PIco can also be equipped with an optional Infra-Red Receiver which is routed directly to GPIO18 via the PCB. Finally, the UPS Pico features an implemented Automatic Temperature Control PWM FAN controller, and can be equipped with a micro fan kit, which enables the use of the Raspberry Pi® in extreme conditions including very high temperature environments. SafePI is an fully open hardware expansion board for raspberry pi model 1B+, 2, 3 providing power supply protection and safe shutdown by using 4 common available AA rechargeable Ni-MH batteries. It notify the Raspberry when primary power is absent on a configurable GpIO (pin 36 or 38) and then give enough time to shutdown from the batteries. When the RPi is on and the primary power is connected, it recharge the batteries. It provide safe voltage regulator giving the ability to power the RPi from 7V to 25V. Buffer Board How to make a Pi Buffer on Veroboard. Each of the 14 outputs can drive up to 500mA using a Darlington array. The BerryClip is a small board providing 6 coloured LEDs, 1 buzzer and 1 switch. It provides an easy and quick introduction to GPIO experimenting. 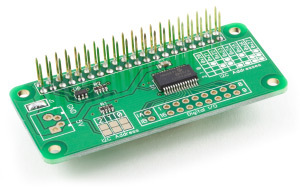 The board plugs directly onto the Raspberry Pi GPIO connector and there are lots of Python example scripts available. 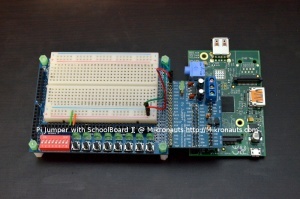 SchoolBoard ][ was designed for electronics students and hobbyists to make experimenting with electronics easier. SchoolBoard ][ provides a large solderless breadboard as well as eight LED's, eight dip switches and eight push button switches, so you do not have to use breadboard space for them. All the LED's and switches have current limiting resistors to protect your circuit. If you like your circuit, you can make it permanent on SchoolBoard ][ boards by soldering the components on the breadboard-like prototyping area. LedBorg is an ultra bright RGB LED add on board for your Raspberry Pi. Capable of 27 colour combinations and controllable from either a GUI or the command line, it can also perform patterns. Small board which connects directly to the GPIO header, Light up your case to suit your mood or display status information. 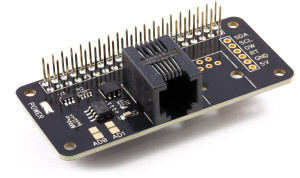 The Lo-tech GPIO Interface Board enables the connection of the Raspberry Pi (B+ and model 2) to the outside world, with 4x opto-isolated inputs, 8x Darlington outputs, and a 1-wire bus for temperature and other sensors. The board has been designed to fit directly on top of the RaspberryPi (similar to the HAT physical specification). 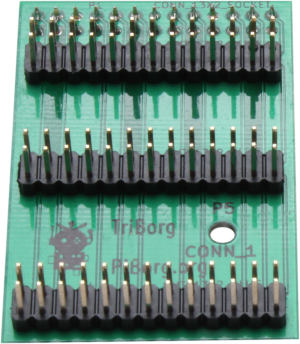 Also available as a bare PCB - ideal for school projects and anyone wanting the extra challenge of soldering some hardware for their Raspberry Pi. As well as a great blog, Meltwater also has a selection of add on boards, including a RGB LED board. This includes 5 bright RGB LEDs, and uses just 8 GPIO pins. The kit includes a pre-prepared strip-board, all the necessary components and cables, and a very complete full-colour manual with lots of code examples. This is a great kit for learning how to use the GPIO on the Raspberry Pi, and make some pretty colours while you are at it! 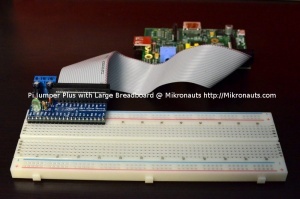 These boards are also available from the Pi Supply shop. 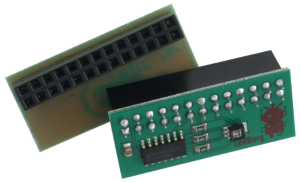 UT Electronics is developing a expansion board containing a fully isolated 16-I/O I2C GPIO expander and RTC, with extensive options for further expansion. C and Python libraries will be available at launch. 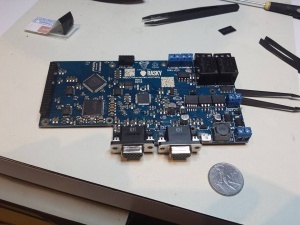 The board will probably be sold as a kit, with SMT components already in place. Update: According to their website, the realities of life prevent them from bringing the product to market. They are hoping someone will pick up the ball. They have released the PCB layout and all documentation for free on their website. set01_04 is a universal 8 bit inputs (microswitch) / outputs (LEDs) to be connected to 3Bpi. Each bit is set as input or output through jumpers position. DiscoHAT is a small board allowing you to do computer controlled lights, sounds and special effects. It is an essential building block for making custom light and sound systems. You can easily create your own home disco based on it. It is also usable for small theatre groups, bands or school projects. 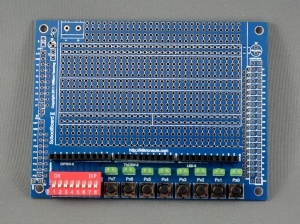 DiscoHAT for Raspberry Pi is a HAT board that has 8 isolated input switches, an isolated DMX output connection and LED strip control for individual LEDs like ws2801. DiscoHAT was developed to be used together with QLC+, an Open Source light and sound control software that is absolutely AMAZING. Connect up to 4 NXT or EV3 motors. Connect up to 5 NXT sensors, both digital and analog. The BrickPi power supply can power the Raspberry Pi directly. Attach LEGO® Technic bricks to the BrickPi case to make awesome robots! 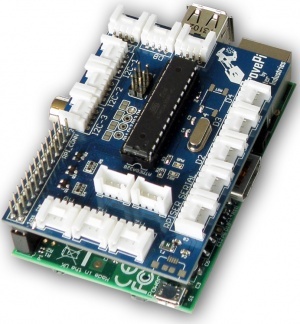 Diablo is a powerful motor control board for your Raspberry Pi. Aimed at driving large motors at up to 40V, current limiting to 55A, makes it powerful enough for even the most ambitious of projects. 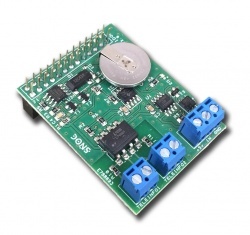 It controls two DC motors in forwards and reverse with pulse width modulation (PWM) which is useful for speed control and various stepper and solenoid control applications. Take a look at DoodleBorg - Our V1 Raspberry Pi tank to get an idea of what Diablo is designed to control. 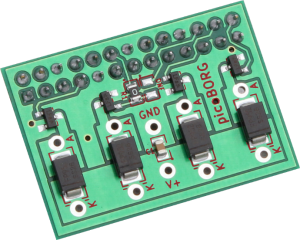 PicoBorg is an inexpensive add on board for controlling robotics such as small motors, fans, solenoids, LEDs and the like from the Raspberry Pi GPIO pins. It consists of 4 low side drivers and 4 diodes, and is hardware selectable for either using the Pi PWM output or only GPIO pins. 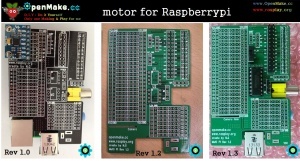 PicoBorg Reverse is an advanced motor control board for Raspberry Pi based robotics projects. It can control small and large motors alike (up to 25 V and 5 A per channel), either driving two DC motors (forward and reverse) at controllable speeds or a single DC motor or stepper at up to 10 A (4, 5, and 6 wire steppers supported). Capable of daisy-chaining multiple boards, it can allow over 200 motors to be controlled from a single Raspberry Pi. It is the motor control board that powers DoodleBorg. Compatible with all other Pi-Plates. PiRoCon PiRoCon is a complete robotics controller for your Raspberry Pi based mobile robot. PiServoController board from OpenElectrons.com fits over the GPIO pins of Raspberry Pi, and it can control upto 6 servos from Raspberry Pi. It has i2c interface to control i2c devices. This board provides power stabilization for Raspberry Pi, so that any power fluctuations won't cause RPi to reset. 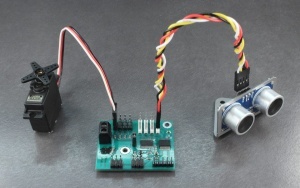 It also provides signal buffering so that you can connect higher voltage servos to the board. For Servo control, it uses Open Source Software, ServoBlaster. Users can program the servo movements in Python. 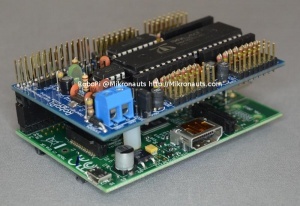 RoboPi Advanced Robot Controller Raspberry Pi expansion board from Mikronauts adds an eight-core 32-bit microcontroller running at 100Mhz to the Raspberry Pi in order to off-load hard real time I/O and allow more precise timing than Linux running on the Pi allows. RoboPi also works with Banana Pro, Banana Pi, ODROID C1, MIPS Creator CI20, more supported platforms soon. Robot Controller with direct connection to RPi is a versalite Mobile Robot Chassis controller board with I2C interface and wireless communication channel. 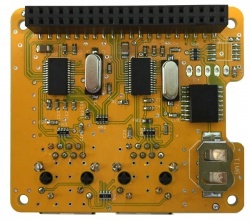 The controller board includes the preprogrammed microcontroller and provides the motor drivers to control 4 DC motors, 2 speed encoder channels, ultrasonic distance measurement channel, infrared obstacle avoidance sensor and 5 analog channels for your sensor connections (line following sensors or obstacle avoidance sensors). The board also provides 2 Servo motor controls to create the robot pan/tilt head. 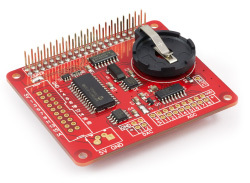 The Raspberry Pi Servo board by adent is a small expansion board for connecting up to eight RC servos and/or an ESC (Electronic Speed Controller) to the RPi. It has a pass through for the GPIO port and it uses the serial line in it for commands. The interface is a simple ASCII-protocol via the serial port. It also has five own GPIO-pins that is not supported by card firmware yet. Firmware is released as GPL. Can power RPi from ESC or external source. Youtube clip of first prototype. Working on an alternate firmware to connect DHT22/11 humidity/temperature sensors to the board instead. 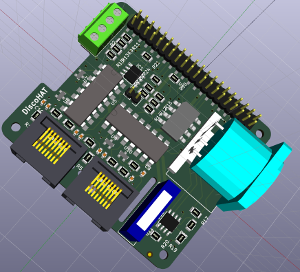 The Raspberry Pi SOFTWARE Servo board by adent is a small expansion board for connecting up to eight RC servos and/or an ESC (Electronic Speed Controller) to the RPi. It has a pass through for the GPIO port. Can power RPi from ESC or external source. It needs a kernel module to work. 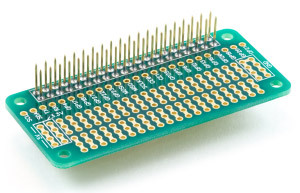 The card only buffers the GPIO of the RPi and provides convenient connectors. Since there was room on the PCB, the serialport, GND and 3V3 is broken out. The Servo PWM Pi Zero is a 16-channel, 12-bit PWM controller suitable for driving LEDs and radio control servos. Designed for the Raspberry Pi Zero, A+, B+, 2 and 3. The board is based around PCA9685 PWM I2C LED controller IC from NXT and can drive each of the 16 outputs with 12 bit (4096 steps) duty cycle from 0% to 100%. ThunderBorg is a powerful dual motor control board for making awesome robots with your Raspberry Pi. It can control small and large motors alike (up to 35 V and a full 5 A per channel), either driving 1-2 DC motors (forward and reverse) at controllable speeds or a single stepper motor (4, 5, and 6 wire steppers supported). It also includes a DC/DC to power your Raspberry Pi and a super bright LED capable of over 16 million colours. 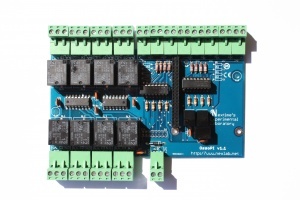 It is the motor control board that powers our MonsterBorg robots used in Formula Pi. 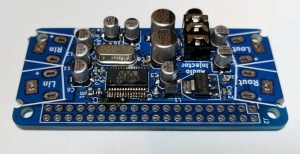 UltraBorg is a 16 bit PWM / servo controller and Ultrasonic module interface board. It communicates with the Raspberry Pi over I2C and does the servo control and ultrasonic reading, processing and filtering in a Pic microcontroller on the UltraBorg board. This leaves the Raspberry Pi free to perform tasks without worrying about timing, delays, or CPU intensive processes. The Ultrasonic side includes inbuilt simple filtering, and the servo side includes power on position saving, and endstop/limit saving in to the Pic micro EEPROM. 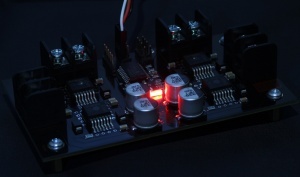 It is capable of controlling 4 servos, and reading 4 ultrasonic modules. It has inbuilt 5V to 3.3V logic level conversion, and is aimed as a plug and go solution. 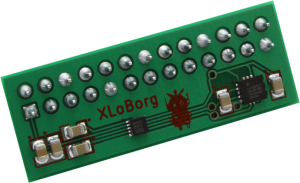 XLoBorg is a 3 axis accelerometer and 3 axis magnetometer which can be used as a compass and would be especially useful in UAV/drones. It plugs directly into the Raspberry Pi and requires no additional connections. Getting started with RabbitMax Flex is super easy. No soldering is required. You can assemble the kit with your bare hands and start using it immediately on Raspbian. Out of the box it supports sensors for temperature, humidity, barometric pressure and light. 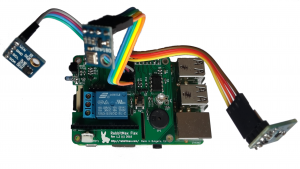 RabbitMax Flex is an entirely open source hardware and open source software project. The PCB has been designed with KiCAD. Comprehensive user's manual with exact steps for getting started is provided. Free and open source examples written in Python and C are available in GitHub. ModMyPi PiOT Relay Board] The ModMyPi PiOT (Pi of Things) relay board is smart! Not quite Skynet smart, so you can tell John Connor to stay at home and play with his Raspberry Pi. But it's much smarter than your average relay board! We've created a Raspberry Pi Relay Board that does away with the complicated wiring and fiddly jumper configuration of your standard relay board, and bundles that control into an on-board PIC, making configuration faster, easier and safer. 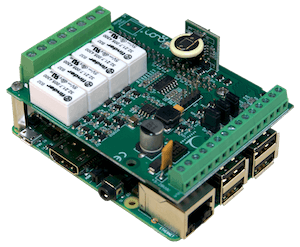 UniPi (v 1.1) is an extension board for the Raspberry Pi, forming together a PLC unit with a wide range of use in automation, regulation and monitoring systems. The board is compatible with a wide variety of software - for custom programming, we recommend either our open-source EVOK API, or the more advanced node-based Mervis control software. The board is however compatible with many more platforms, most of them open-source. For more information, visit the software choice manual. 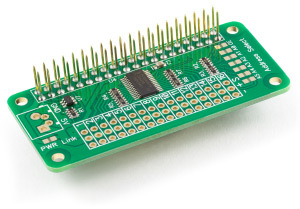 UniPi 1.1 Lite is essentially only a smaller variant of the UniPi 1.1 with reduced dimensions, designed to be a more affordable and simpler alternative to the "full-size" 1.1 board. It is thus ideal for smaller automation projects. UniPi Neuron is a product line of fully modular PLC units designed for the highest possible level of versatility. Neuron, being effectively a successor to the UniPi 1.1, retains the Raspberry Pi as the central processing unit, connected to a modular PCB designed by us. Boards are designed to be interchangeable and modular, allowing us to offer a wide range of models differing in number and type of I/O modules for the total of 12 Neuron units available. The core product is the Neuron S103 unit, all subsequent models are then "only" an extension or modification of the S103. 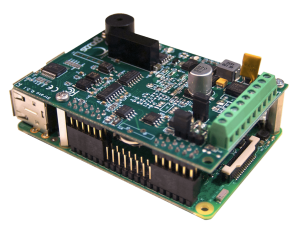 All boards are equipped with STM32 microprocessors with our custom firmware, serving as direct controllers of all I/0 modules. Depending on the product line, the unit can feature from a single STM32 (S-line) up to three (L-line). Microprocessors are able to function independently on the Raspberry Pi, allowing the user to retain a basic control of all I/O modules in case of Raspberry Pi malfunction or software issues. Each board is issued with an unique QR code, containing all necessary data for identification and component backtracking. The whole Neuron product line is compatible with a wide variety of software - for custom programming, we recommend either our open-source EVOK API, or the more advanced node-based Mervis control software. The board is however compatible with many more platforms, most of them open-source. For more information, visit the software choice manual. 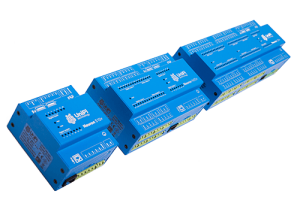 UniPi Neuron Extension modules are designed for fast and easy extension of automation systems. Modules are based on UniPi Neuron models, the Raspberry Pi computer is however replaced with another PCB containing additional I/O modules. Thanks to the RS485 interface, extension modules can be used with any PLC unit supporting the RS485 bus and Modbus protocol - they are thus not limited only for use with Neuron units. That makes extension modules a suitable choice in cases, where different PLC manufacturer either does not support native extension modules, or their purchase would be too expensive. 1x RS485 universal bus interface. All XS-series models are uniformly 4 DIN sized. 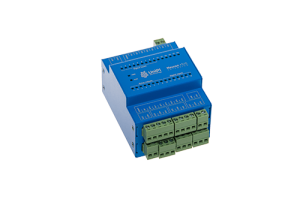 Extension modules are addressed either via control software running on the remote master control unit, or the address can be set manually via integrated DIP switch. The switch allows to set 4 bits of address and is evaluated according to software preferences - if the DIP switch is set to zero ("0000" address), all DIP settings are ignored and software settings are used instead. PiPan is a Pan/Tilt Kit for PiCamera designed by OpenElectrons.com. Pi-Pan provides Pan and tilt movements for your Raspberry Pi Camera, using two servos for X and Y axis movements. The kit includes servos, mounting hardware and PiServoController board to control servo movements. Users can program the servo control/camera movements, etc. in Python. There also is an addon light that can be fitted in front of the PiCamera to illuminate subjects, PiLight. 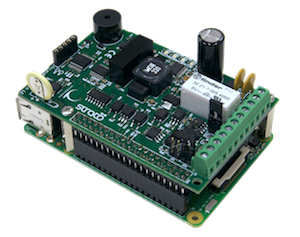 RPIDOM v2 is the ideal expansion card for developing a standalone home automation server, measuring the power consumption of your home and / or production of your photovoltaic system. - 1 x saved clock (RTC DS1338) by a super-capa recharged automatically by the raspberry pi when it is powered on. 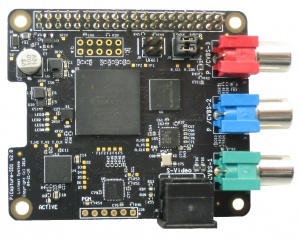 Heber x10i integrates real time I/O into a rPi/rPi2 control system. A secure real-time controller that permits control over multiple and different types of inputs and outputs, and uses the USB 2.0 communication standard. It is an all in one plug and play board for developing LED drivers, control, sensing of different switches, and driving stepper motors. Exclusive features include a real time clock, battery backed static ram, a Dallas chip (for unique board identification), 2 serial communication ports, a powerful audio amp and a independent dedicated on board processor. Heber xSpin has been perfectly designed to be added to Raspberry Pi/Pi2, or any Windows® or Linux gaming system equipped with a USB port. Capable of driving up to 8 mechanical spin reels / stepper motors, XSpin is perfect for controlling mechanical, multi bank spin reel gaming machines, top boxes and multi-client applications. Real time control of reels. XSpin supports a wide range of industry standard reels, with custom ramp tables available for non-standard reels. The dedicated onboard processor on XSpin guarantees real time control of mechanical spin reels, which ensures no slow down or delay in reel movement. XSpin also controls four lamps or LEDs per reel with individual on/off control. 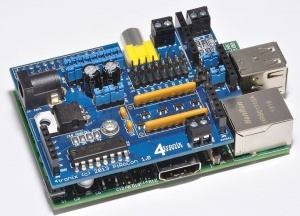 Heber now offers drivers in C/C++ and Linux to make it even easier for programmers, inventors and developers to connect with the outside world using X10i and their Raspberry Pi. SmartHome SmartHome Lite SmartHome Server SmartHome AC control Box The Smart Home project is aimed towards creating a system capable of controlling devices over the internet from any device. Currently the system supports up to 8 Controlled devices and 1 DHT 2302/22 Temperature and Humidity Sensor. The main device ( G1 ) Can be triggered by temperature (with a DHT sensor) or time. The system uses Solid State Relays ( SSR ) or Switching Relays, The Switching Relays are louder and sound a "Click" when they switch. The SSR support to 10Amps . The system can be deployed to control your air conditioning during the hot summers or electronic heaters during the winter, another use would be to wire the system up to your house lights / power and control your lights from over the internet. Additional items are the 84x48 pixel screen to show extra info, last command sent and a countdown to update / check server status and also show Temperature and Humidity. The advantage to using our system over another system is that everything is built for each other ( The Temperature sensors, the relays, and the screen ). The system uses the internet through WiFi or an Ethernet cable to connect to our secure servers which enable the website interface and the Android app to easily communicate with your device. RPISIGFOX is a Raspberry Pi SigFox expension Shield delivered within a kit including a 4M Rail DIN Enclosure, an Antenna and an UFL cable. 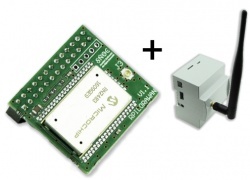 This SigFox communication board for Raspberry Pi will enable you to use the SigFox network to transmit any data very simply. 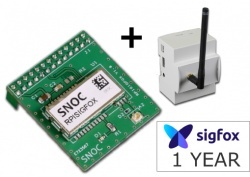 The RPISigFox card Pi is SigFox Ready certified Class 0 (the best one), that is to say with the best capabilities to communicate with the network. The SigFox network allows to send 12 bytes messages long and is nationaly available in many European countries. RPILORAWAN is a Raspberry Pi LoraWan expension shield delivered within a kit including a 4M Rail DIN Enclosure, an Antenna and an UFL cable. This LoraWan communication board for Raspberry Pi will allow you to use the Lora network to transmit information where you wish. The board is design with theRN2483 Microchip Lora module. It allows to connect to the operated LoRa networks called 'LORAWAN'. To use this card, you must either have a subscription to a telecom operator offering operated LoraWan connectivity or a Lorawan gateway for the installation of a private network. CanBerryDual ISO V2.1 is an extension board for RaspBerry Pi. It is an Open Hardware Design. It has two functionalities: a can bus module and an onboard Real Time clock powered by a 12 mm battery. The CanBus is based on a couple of MCP2515 SPI controllers and ISO1050 tranceivers. All functionalities are full integrated in standard linux kernel, so, they can be avaible on fly, or at last recompiling linux kernel to add canbus functionalities. 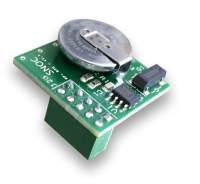 The real time clock is based on DS3231 with internal oscillator I2C controller. CanBerryDual V2.1 is an extension board for RaspBerry Pi. It is an Open Hardware Design. It has two functionalities: a can bus module and an onboard Real Time clock powered by a 12 mm battery. The CanBus is based on a couple of MCP2515 SPI controllers and MCP2551 tranceivers. All functionalities are full integrated in standard linux kernel, so, they can be avaible on fly, or at last recompiling linux kernel to add canbus functionalities. The real time clock is based on DS3231 with internal oscillator I2C controller. EtherBerry V 1.6 is an extension board for RaspBerry Pi based on LAN9252 EtherCAT® Slave produced by Microchip. The LAN9252 is a 2/3-port EtherCAT® slave controller wi th integrated dual Ethernet PHYs Which Contain each to full-duplex 100BASE-TX transceiver and support 100Mbps (100 BASE-TX) operation. Three possible configurations are possible: Microcontroller Mode, Digital I / O and Expansion Mode. Our board implements a fusion between the Microcontroller mode and the Digital I/O. Every EtherCAT® slave requires a Vendor ID, we use the ID of SG Electronic Systems. This company supports us with boards distribution and their customization. The real time clock is based on DS3231 with internal oscillator I2C controller. 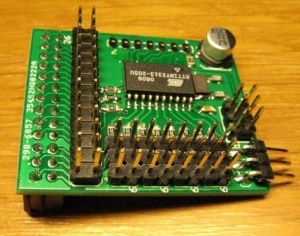 EthernetBerry Dual V 1.1 is an extension board for RaspBerry Pi. It is an Open Hardware Design. It has two functionalities: a dual Ethernet interface and an on board Real Time clock powered by a 12 mm battery. The Ethernet is based on ENC28J60 a SPI controller, it is a stand-alone Ethernet controller with an industry standard Serial Peripheral Interface (SPI). The real time clock is based on DS3231 an I2C controller with internal oscillator. The ENC28J60 meets all of the IEEE 802.3 specifications and it is full integrated in linux kernel. The 1 Wire Pi Plus from AB Electronics UK is a communication board supporting the 1-Wire® protocol. 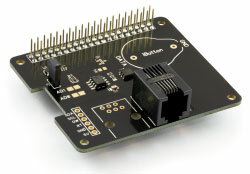 A 5V buffered I2C port is also provided on the board. The 1 Wire Pi Zero from AB Electronics UK is a communication board supporting the 1-Wire® protocol. Designed for the Raspberry Pi Zero. A 5V buffered I2C port is also provided on the board. 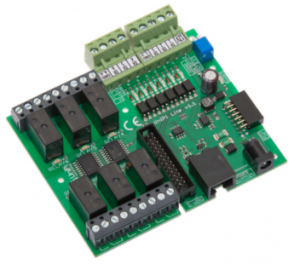 Sheepwalk Electronics have developed a series of expansion boards for the Raspberry Pi to interface your Raspberry Pi to a Dallas/Maxim 1-Wire network. The range includes a simple passive "master" (called the RPI1) to allow easy use of the kernel 1-Wire driver, a single channel I2C master based around the DS2482-100 (called the RPI2) and an 8 channel I2C master based around the DS2482-800 (the RPI3). The modules are now all available for sale on our website. We also sell a range 1-Wire slave boards including temperature and humidity sensors and I/O boards. 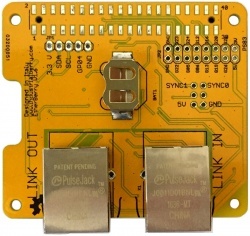 Pi232 is an RS232 expansion board that plugs onto GPIO connector. Pi-Wire Homelabs are developing options for connection of a 1-wire bus to the RaspberryPi. Boards include SPI breakout connections for future boards. 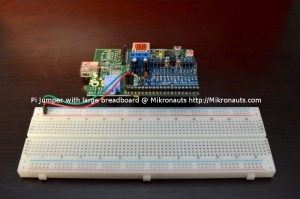 BitWizard has a Raspberrypi serial breakout board. It breaks out four serial buses from the GPIO port. BitWizard then has a series SPI (or I2C) expansion boards that can be daisy-chained off the SPI (or I2C) buses of the expansion board. A virtually unlimited number of expansion boards can be connected. Expansion boards are available that drive a simple 16x2 text LCD, more general purpose IOs, servos, temperature sensors, relays, optocouplers etc. set01_03 translates RS232 signals to TTL to be connected to P2's 3Bpi serial communication port. The RS485 Pi is a stackable communication board supporting the RS485 serial protocol. 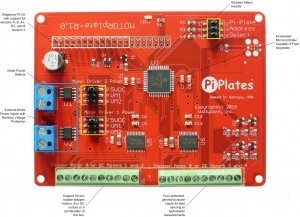 The Serial Pi Plus is a stackable communication board supporting the RS232 serial protocol. The Serial Pi Zero is a stackable communication board supporting the RS232 serial protocol. Designed for the Raspberry Pi Zero. set01_05 has three functions : 1st) translating USB to TTL Tx and Rx to be connected to 3Bpi, 2nd) converting USB to I2C and 3rd) supplying voltage to next board (it is not for 3Bpi) if jumper is between positions 1 and 2. 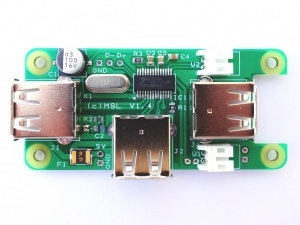 The USB Hub Zero is a USB hub designed for the Raspberry Pi Zero. Having the same footprint, it is mounted under the Pi Zero and can be powered from the Pi Zero. Inbuilt microphone on the board, for voice commands or other tasks. Bypass function to allow analog straight through from input to output. Driver available with the stock Raspbian linux kernel, add the line "dtoverlay=audioinjector-wm8731-audio" to /boot/config.txt to get it running. Also available on github in the kernel sources. Available at the Audio Injector Shop. Homepage. A high-end 24bit/192kHz DAC that connects to the I2S header. The board has RCA and phono jack line-level outputs with 2Vrms output, but does not need an external power supply. 192kHz 24-bit Stereo Input and Output, MIDI, etc. “À la mode” is an Arduino clone specifically designed to interface with the Raspberry Pi. You can of course connect a standard Arduino to a Pi USB port using a cord, but when you want a turnkey solution, how about an Arduino compatible “plate” (shield) that fits right on top of the Raspberry Pi with direct access to GPIO port? The Linux side handles all of the displays, human interfaces, and number crunching. The low power Arduino compatible “à la mode” board handles sensors, servos/motors, and provides a highly accurate real time clock. The ArduiPi is a board that brings Arduino world to Raspberry Pi and vice-versa. It is totally open source Hardware and Software. FTDI cable connector to be able to program Arduino independently leaving RX/TX of arduino and Raspberry free. Power level shifter between Pi and Arduino for I2C, SPI, Serial, and all Pi V1 and V2 GPIO pins. Sized place for 3 x 1-Wire devices on board. Two free pins available on level shifter chip for custom usage. Raspberry Pi to Arduino Shields Connection Bridge allows you to use any of the shields, boards and modules designed for Arduino in Raspberry Pi. 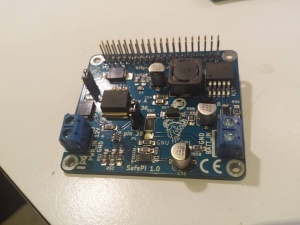 It includes also the possibility of connecting digital and analog sensors, using the same pinout of Arduino but with the power and capabilities of Raspberry. Using arduPi library, you will be able to make programs in Raspberry with the same code used in Arduino. To do so, Cooking Hacks Team have implemented conversion functions so that you can control in the same way as in Arduino all the I/O interfaces: i2C, SPI, UART, analog, digital, in Raspberry Pi. Paper-Duino-Pi is an Arduino shield for the Raspberry Pi. Due to the fact that it is designed as Paper-PCB it is easy to create and one doesn't need a printed circuit board. All components are cheap standard electronic parts. A video is found here. RPi-ShieldBridge An Arduino Shield Bridge with connector for a 2.8" TFT-Display with Touchpanel. 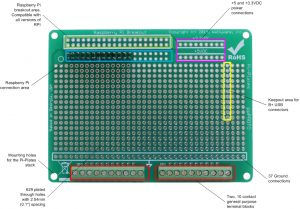 RPIRTC v2 is a Real Time Clock (RTC) shield to keep your Raspberry Pi always on time. This shield brings you a best in class RTC IC, the DS1338 + a long lasting Lithium battery that allows your Rasberry Pi board to always have the correct date and time, even after reboot. This shield have built in support in the major current Linux builds. - Board connection with I²C. AbioRTC is an inexpensive real-time clock (RTC) expansion board. The RTC Pi is a real time clock module which connects via the GPIO port on a Raspberry Pi. 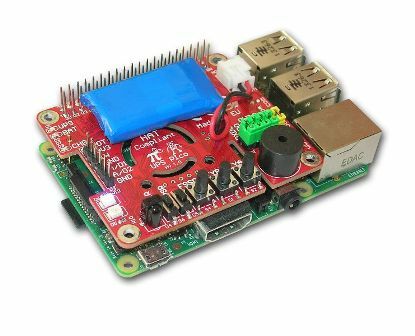 Mikronauts Pi Rtc Dio Real Time Clock & I/O Expansion Board that stacks on top of the Raspberry Pi and was designed by Mikronauts to add a real time clock, 32 digital I/O's and 3.3v power supply making one-off expansion circuits easier for everyone. Pi Rtc Dio also has a four pin I2C expansion header, and a five pin COM connector for future expansion. Pi Rtc DIO also works with the Banana Pro and the Banana Pi, however the Bananas already have an on-board RTC. Pi Rtc Dio comes as a kit which includes an extra tall stacking header and mounting hardware that secures the board to the Raspberry Pi Rev.2 test mounting holes - keeping the board securely mounted on the Pi. 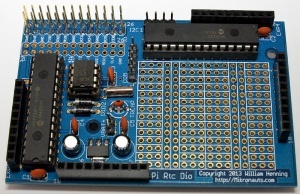 Up to four Pi Rtc Dio boards can be stacked on a single Raspberry Pi without the need for a bus or rack solution. The board has an extra large prototyping area that is silk screened to clearly indicate signal busses. The Raspberry Pi VGA Board by lo-tech.co.uk is a high-quality display board that provides second-screen or just VGA output to Raspberry Pi boards equipped with 40-pin GPIO header. The two screens can be connected concurrently and used independently, and are both powered directly by the RPi’s GPU and so achieve the same performance. This board protects the Raspberry Pi from ESD and is CE Marked (Class B) and provides 24-bit colour. The AdvaBoard RPi1 contains an interface for TFT displays (3.2" - 7.0") incl. touchscreen. For details, see [#advaboard_rpi1 below], or visit the websites www.advaboard.de or www.advamation.com/products/embeddedpc/advaboard.html. Purchase on Yadom Shop : here. 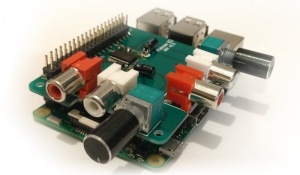 The ADC Pi is an 8 channel 17 bit analogue to digital converter designed for the Raspberry Pi. The ADC Pi is based on two Microchip MCP3424 A/D converters each containing 4 analogue inputs with up to 18 bit resolution. The ADC Differential Pi is an 8 channel 18 bit differential analogue to digital converter designed for the Raspberry Pi A+, B+, Raspberry Pi 2 and 3. The ADC Differential Pi is based on two Microchip MCP3424 A/D converters each containing 4 analogue inputs with up to 18 bit resolution. The ADCDAC Pi Zero is a 2 channel 12 bit analogue to digital converter and 2 channel 12 bit digital to analogue converter designed to work with the Raspberry Pi Zero, A+, B+, 2 and 3.
with driver support. Fully compatible with the B+! The RasPiComm+ will be launched Q1 2015. If you want to have it before the official launch, you can support the Indiegogo campaign. The Expander Pi contains 16 digital inputs or outputs, 8 analogue inputs, 2 analogue outputs and a real-time clock. CAN controller and transceiver (2515 based). DB9 connection to vehicle OBDII connector, pins for a robot Controller Area Network. The Breakout Pi Plus is a useful and versatile prototyping expansion board for the Raspberry Pi. The Breakout Pi Zero is a useful and versatile prototyping expansion board for the Raspberry Pi Zero. Buzzberry is an interface board enabling expansion using the Buzz-Board modular system designed primarily for educational use. This board is a buffer between your Rpi and the real world, use it to flash LEDs on and off, drive motors, run sensors and all that other fun stuff. Raspberry Geli Board Extends the GPIO and provides I2C, D2A/A2D, DC Motor(L298), RS232, Realtime Clock (DS1307), 1-wire and prototyping area on 150 * 100mmm PCB. Modular plug and play modules, no more headaches for wiring the sensors. All modules are connect using a simple 4 wire cable. Access Grove analog, digital, serial and I2C sensors from Raspberry Pi. 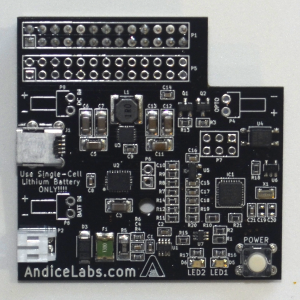 Sockets: 3x Analog, 6x Digital, 4x I2C, 1x serial and 1x pass-through Raspberry Pi serial. Libraries available in C and Python - see GitHub repo. The GrovePi communicates with the Raspberry Pi over the I2C interface at address 0x40. I2C sockets allow sensors to directly communicate with the Raspberry Pi or interpreted and relayed via the GrovePi. 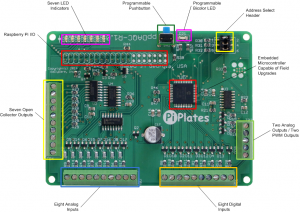 The IO Pi Plus is a 32 channel digital expansion board designed for the Raspberry Pi A+, B+ and Raspberry Pi 2. 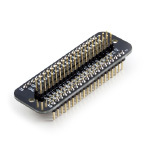 The board is based around the MCP23017 16-bit I/O expander from Microchip Technology Inc. A pair of MCP23017 expanders are included on the board allowing you to connect up to 32 digital inputs or outputs to the Raspberry Pi. The IO Pi Zero is a 32 channel digital expansion board designed for the Raspberry Pi Zero, A+, B+, Raspberry Pi 2 and 3. 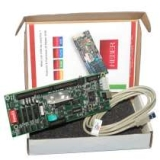 The board is based around the MCP23017 16-bit I/O expander from Microchip Technology Inc.
Iono Pi complies with CE directives for EMC, Electrical Safety, Emission and RoHS. It is also available pre-assembled in a standard 4 modules DIN rail case together with a Raspberry Pi 3 Model B.
Pi MiniLab Education / Experimental Board is a small size RPi add-ons board. The board includes the circuitry for the experiments with analog signals, sensor connections and circuitry to control the external devices as the relays, motors, high current LEDs. Key Features: 12-bit ADC with 5 analog channels, 12-bit DAC, 4 analog amplifiers, analog comparator, frequency generator, 1-Wire port, on-boar potentiometer, RGB LED, 4 high power outputs, circuitry for LCD 20x4 or 16x2, voltage regulator. Board size - 2.1"x1.6" (53mm x 41mm). Mikronauts Pi Rtc Dio Silver I/O Expansion Board stacks on top of the Raspberry Pi and was designed by Mikronauts to add 32 digital I/O's and 3.3v power supply making one-off expansion circuits easier for everyone. Pi Rtc Dio Silver also has a four pin I2C expansion header, and a five pin COM connector for future expansion. Please note: Pi Rtc Dio Silver does NOT include an RTC. Mikronauts EZasPi advanced prototyping board that stacks on top of the Raspberry Pi and was designed by Mikronauts to make prototyping easier for educational users, and making one-off expansion circuits easier for everyone. 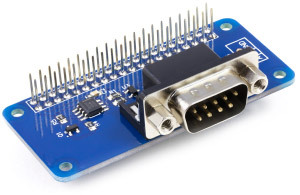 EZasPi also has a four pin I2C expansion header, and a five pin COM connector for future expansion. EZasPi also works with the Banana Pro and the Banana Pi, ODROID C1 and MIPS Creator CI20. EZasPi comes as a kit which includes an extra tall stacking header and mounting hardware that secures the board to the Raspberry Pi Rev.2 test mounting holes - keeping the board securely mounted on the Pi. 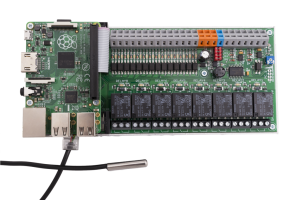 Multiple EZasPi boards can be stacked on a single Raspberry Pi without the need for a bus or rack solution. The board has an extra large prototyping area that is silk screened to clearly indicate signal busses. For example, you can stack an EZasPi board between your Raspberry Pi and a RoboPi robot controller to add additional custom circuits to the Raspberry Pi. You can make a Pi Sandwich by stacking an EZasPi on top of your Raspberry Pi, and an EZasPi (B) under your Pi - with the mounting hardware securing your boards together. Mikronauts EZasPi (B) advanced prototyping board from Mikronauts is first prototyping board that stacks UNDER the rev.2 Raspberry Pi Model A and Model B. EZasPi was designed to make prototyping easier for educational users, and making one-off expansion circuits easier for everyone. 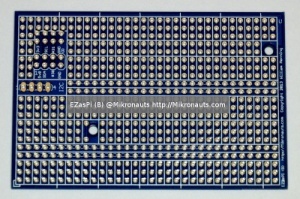 EZasPi (B) also has a four pin I2C expansion header for future expansion. EZasPi (B) comes as a kit which includes an extra tall stacking header and mounting hardware that secures the board to the Raspberry Pi Rev.2 test mounting holes - keeping the board securely mounted on the Pi. Multiple EZasPi (B) boards can be stacked beneath a single Raspberry Pi without the need for a bus or rack solution. The board has an extra large prototyping area that is silk screened to clearly indicate signal busses. Adafruit Industries announced in March 2012 the intention of making expansion boards for the Raspberry Pi under the "Pi Plate" name.. The first board available is a prototyping board that overlays the Raspberry Pi via a long plug-in header. It has screw terminals for all the Pi GPIO lines. PiPLUS Multifunction I/O Extension Board is designed as versatile, general-purpose data acquisition and control module. Key Features: Battery-backed Real Time Clock; 3.5A DC motor driver chip; 8-bits digital I/O Data Port; 10-bits ADC with 4 analog channels; DAC; 4 high power outputs; 4 PWM outputs; IR Remote Control input; 2 user's buttons; AVR ATMEGA328P microcontroller with a preloaded Arduino bootloader and Arduino Shields connectors; 3V - 5V buffers for I2C, SPI and Serial interfaces; Power supply with 5V and 3V regulators. 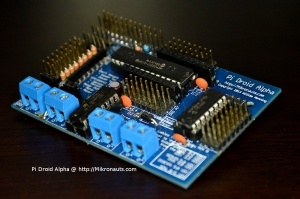 PiPLUS board also works as a bridge between Raspberry Pi and ARDUINO and provides a direct connection to Arduino Shields. You can use the standard ARDUINO environment and graphical interface for Windows or Linux for software development and ATMEGA328P microcontroller programming. Not yet tested, comments welcome Project files for Eagle here:  Schematic and Board images:   This board uses Microchip 16-pin GPIO expanders driven by SPI to provide up to 256 additional GPIO pins at a very low cost. Optionally, it can supply power for the board and the Raspberry PI. 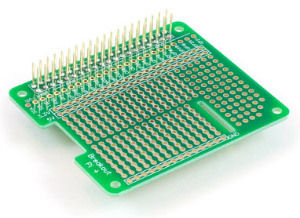 The board can be made in a stackable manner allowing you to also place additional peripherals on the GPIO connector. It makes non-exclusive use of all four SPI pins as well as exclusive use of the CE0 Pin. If you install (and power) the power supply components, the board will supply up to 1A at 5VDC. This is not enough to power all GPIO pins on a fully populated board, but in most applications should be sufficient to power the RPI and a reasonable number of GPIOs. An external power supply should be used for higher-power applications. This board should never be powered from the RPI as even one of the chips can draw more than the RPI can provide. The power supply is quite flexible and will accept anything from 8-25VAC or 8-42VDC. It is based on a Recom module which provides a switching power supply in a form factor that is a drop-in replacement for 7805 series TO-220 linear regulators. The 8 chips can be had for about $4@ or less and the power supply components total about $15. 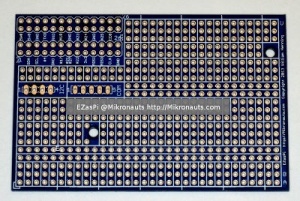 A fully populated board is about $49+PCB, $31+PCB for 64 GPIO pins. You can have the PCB made at a variety of fabricators. does very nice work and is hobbyist friendly at very reasonable prices. 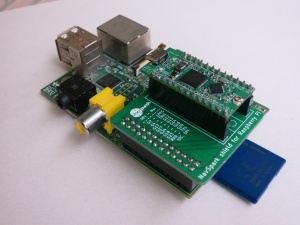 PiWeather RPi Weather Station Board is a small size RPi add-ons board. The board provides the temperature, pressure, humidity monitoring and controls the external devices (relays, high current LEDs ...). Key Features: Temperature, pressure and humidity sensors on the board; Two 1-Wire ports to connect the external temperature sensors DS18B20; Four high current outputs; Battery-backed Real Time Clock and Calendar; Small size - 2.1"x1.6" (53mm x 41mm). Quick2Wire GPIO board and experimenters kit is an extension board for the Raspberry Pi that has level converters to allow the driving of TTL and real world devices such as LED's and switches. It will also provide an experimenters kit, a software framework and a number of tutorials. 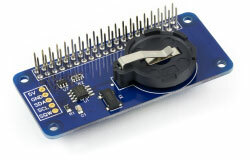 The Quick2Wire interface board is also available from Pi Supply. forum thread showing 'paper mockup'. Another buffered IO expander. SainSmart X100 Expansion Board SainSmart offers the X100 expansion board "designed for ease of use", intended to make the RPi easier to use by providing various interface ports, such as a RS232 port, a HDMI to VGA converter (by using an included HDMI to HDMI male adapter, enabling the use of the VGA port; otherwise it is a HDMI input), a 3-port USB hub (one of the X100's USB ports connects to the upper USB port on the RPi itself, using an included USB to USB male adapter, thus providing power for the three other USB ports on the X100 board), SD and microSD memory card readers, an 8-channel Darlington driver and a GPIO port. The board also has a battery-powered RTC, and a variable (6-23V, nominally 12V) power port for a corded power supply. The X100 also has a reset switch, but the reset pin header (included with the X100) must be soldered onto the RPi itself. Slice of Pi Ciseco have produced a convienient small break out board for the Raspberry PI. 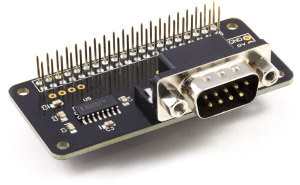 XBee style connector for XRF / XBee / RN-XV / XBT / RF-BEE etc. Has the SPI and I2C pins on one standard 8 way header and the Raspberry PI's 8 general purpose I/O pins on another for easy access. Comes as a kit of parts that needs to be soldered. 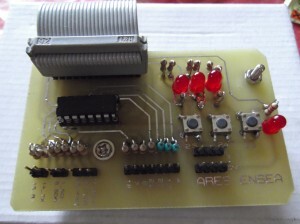 Construction is very easy and suitable for children with basic soldering skills. Slice of PI/O is a variation of the above produced by Ciseco based upon Nathan Chantrell's MCP23017/Slice of Pi "project". The MCP23017 may be powered from either the Pi's 3.3V/5.0V GPIO pins or, with care, an external psu. The use of a 5.0V power source means that the MCP23017's 16 (2 x 8) GPIO's can interface directly with 5V logic families etc. However, the Pi's own GPIO's, also available, will still need 3.3V - 5.0V level shifters. Trevor Gowen's experimental LED BarGraph "board" has been "piggy-backed" onto one of these. 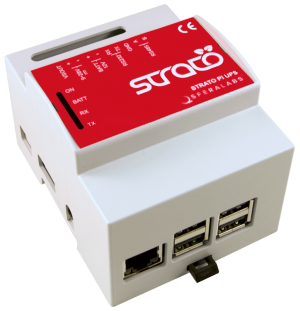 Strato Pi by Sfera Labs enhances the Raspberry Pi computer with several hardware features to make it suitable for use in professional and industrial applications where reliability and service continuity are key requirements. Strato Pi complies with the 2014/35/UE (Low Voltage) and 2014/30/UE (EMC) CE directives, and the harmonised standards for electromagnetic compatibility (EN61000-6-2:2005), electrical safety (EN60664-1:2007), emission (EN61000-6-4:2007) as well as the RoHS directive for hazardous substances (2011/65/UE). It is also compliant with part 15 of the FCC rules (Class A), ICES-003 (A) and CISPR 32:2015 (Class A) standards. Industrial computer based on the Raspberry Pi Compute Module, in a compact 2 modules DIN rail case. 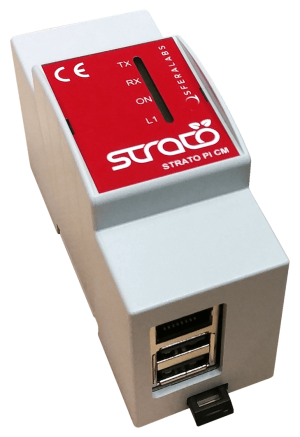 It is available in two versions: Strato Pi CM 3 ships with a Raspberry Pi Compute Module 3 pre-installed, while Strato Pi CM Solo doesn’t include the Compute Module and is compatible with all current versions of the Compute Module: 1, 3 and 3 Lite. 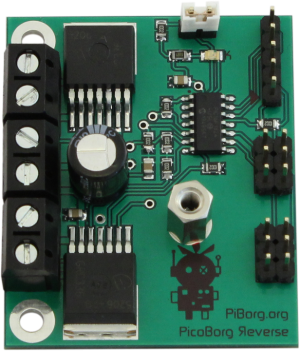 TriBorg A GPIO header replicator board for your Raspberry Pi. 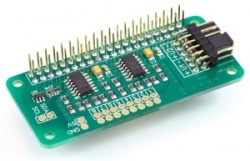 Triple the Raspberry Pi GPIO header (26 pins). This is the older version best suited for early Raspberry Pi models. 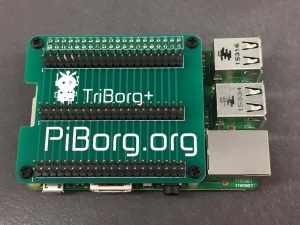 TriBorg Plus A GPIO header replicator board for your Raspberry Pi. Triple the new 40-pin Raspberry Pi GPIO header. This is the newer version best suited for newer Raspberry Pi models. 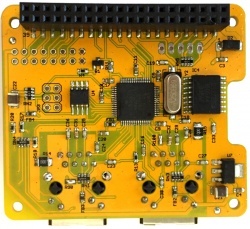 The Raspberry Pi XBee ZB SMT Backpack by bootc is a carrier board for Digi XBee ZB SMT modules. 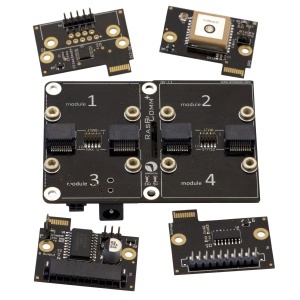 These are different to the normal XBee modules because they are surface mount and additionally can interface to a host using SPI as well as serial. The backpack also features 3 LEDs for status signals as well as two FTDI headers (one for the RPi and one for the XBee), as well as being able to host a 'normal' XBee module (though of course you can't use SPI with those). The RPi-COC board from busware.de adds Onewire, a Sub-1 GHz RF Transceiver, RTC and an EEPROM mainly for smart home automation. The Onewire RJ11 port is driven by a DS2482 chip supported by 5V levelshifter and strong pullup. The DS1339-RTC is powered by CR2032 battery or on-board 60mF supercap. The 2Kbit EEPROM (at24c02) is mainly to hold board specific config data. The CC1101 Sub-1 GHz RF Transceiver is controlled by an atmega1284 to pre-process air data. 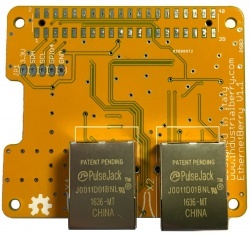 It is connected to RPis UART and contains a avr109-bootloader for firmware updates. The popular culfw-firmware lets you interact with FS20, Homematic, Intertechno or similar actors and sensors - easily using FHEM-home automation server. In addition a secured 5V power socket for external power supplies is provided. 3Bpi, aka set05_08, translates bidirectionally inputs/outputs of the Raspberry Pi's GPIO from 3.3V to 5V TTL levels. It has three external ports to connect electronics.cat open source hardware boards. This board takes advantage of P5's Raspberry Pi, with access to a second I2C channel (I2C_0, it can be used without camera connected) and CTS and RTS for hardware flow control in serial communications. 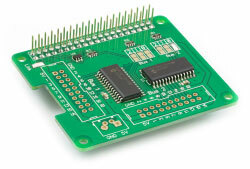 Two of 3Bpi's ports, P3 and P4, can be used as 8 bit input/output or I2C and/or SPI ports. One port, P2, is thought for serial communications and Raspberry Pi can be set as master or slave setting the jumpers properly. AbioWire+ is a 1-Wire adapter providing seventeen 1-Wire channels with ESD protection, three 1-Wire controller chips, and a real-time clock (RTC). 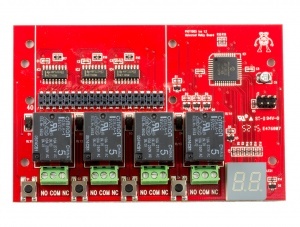 AbioCard model A expansion board featuring a real-time clock (RTC), 8 bidirectional I/O lines, 8 12-bit ADC inputs, 16 PWM outputs at 97 kHz with 8-bit resolution. AbioCard model B expansion board featuring a real-time clock (RTC), 8 bidirectional I/O lines, 8 12-bit ADC inputs, 16 PWM outputs at 40-1000 Hz with 12-bit resolution. 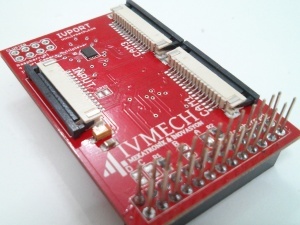 The IVPort from Ivmech Mechatronics is the first Raspberry Pi (also Raspberry Pi A, A+, B+ and Raspberry Pi 2 fully compatible) Camera Module Multiplexer is designed to make possible connecting more than one camera module to single CSI camera port on Raspberry Pis. 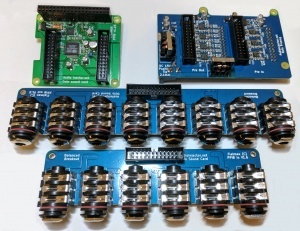 Multiplexing can be controlled by 3 pins for 4 camera modules, 5 pins for 8 camera modules and 9 pins for maximum up to 16 camera modules with using GPIO. The closest approach to simultaneous capturing at 640x480 resolution with 7 fps each camera connected to Ivport Camera Multiplexer (4 camera boards were connected.) by utilizing Raspberry Pi's video-capture capabilities with a JPEG encoder. See more details here. 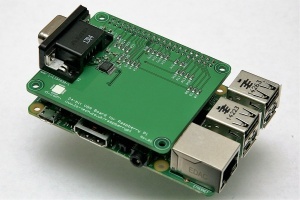 Rasky is an expansion board for raspberry pi model 2B to use the rpi as a KVM over IP. It features VGA video acquisition, 2 250VAC 10A relays, 2 digital opto-isolated digital inputs, keyboard, mouse and remote storage emulation over USB, power management using 4 Ni-MH rechargeable AA batteries to assure rpi clean shutdown in case of power loss/failure. It is actually in crowdfunding, but production will go on no matter how the campaign will end, the price anyway will change depending on the campaign success. Estimated delivery for the first batch is Q2 2016, it will be available both as a kit and ready to use. All developement, both for hw and sw, is completely open source. NavSpark is a satellite-navigation (GPS, GLONASS, and Beidou) enabled Arduino-compatible microcontroller board. 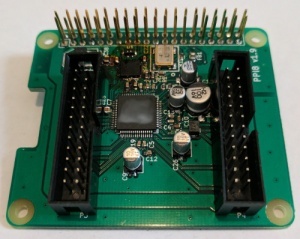 The NavSpark shield for RPi enabled connecting a full-size NavSpark board to the Pi, including GPIO, the serial line broadcasting the NMEA messages, the 1PPS channel for higher precision timekeeping, I2C, SPI. It enables navigation, or satellite-backed NTP server use cases, as well as general on-board MCU use (similar to the other Arduino shields). The Guzunty Pi adds open source programmable hardware to the Raspberry Pi at an amazingly low price. The design contains a 72 macrocell programmable logic device, so the board functions like a 'virtual breadboard'. This board is ideal for those with many different projects in mind, because it is so flexible. It can be a simple IO expander, a 7 segment LED driver, provide servo and regular PWM outputs, or anything you can dream up that will fit into 1600 logic gates. The device is '5 volt tolerant' and so can be used to safely interface 5v logic devices (such as Arduino) to the 3.3v Raspberry Pi. The GitHub community site contains many ready made cores that you can download and use directly. You can design your own custom cores using industry standard languages such as VHDL or Verilog. 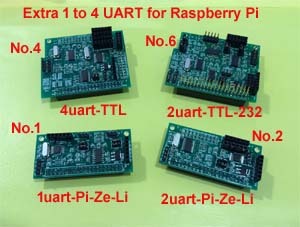 The LOGI-PI (http://valentfx.com/logi-pi/) is an FPGA-based daughter board for the raspberry-pi. It consists in a Spartan 6 LX9 FPGA from Xilinx, 32MB SDRAM, PMODS (standardized IO connector) and an Arduino compatible connector. The board communicates with the raspberry-pi through SPI and comes with VHDL support file and Python/C support software. The Raspberry-pi can directly program the FPGA thus eliminating the need for an expensive FPGA programmer. A web based-tool (http://www.valentfx.com/skeleton/) allow the user to design the architecture to be run on the FPGA without the need of writing a single line of HDL code. 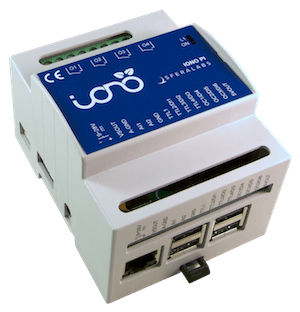 The LOGI-Pi comes with several demo applications including bitcoin mining, vision processing (with the optional camera module) and more. PiCapture (http://lintestsystems.com/products/picapture-sd1) is a video capture solution that enables all of the video processing capability of the Raspberry Pi Graphics Processing Unit (GPU). PiCapture SD1 captures standard-definition interlaced video in the CVBS standard (NTSC/PAL) from Composite, S-Video, and YPbPr Component sources as 640×480 video. 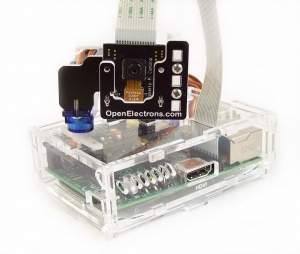 By using the Raspberry Pi CSI-2 camera interface and providing complete camera emulation, all of the video encoding and management capabilities of the Raspberry Pi are usable with any compatible video source. In addition, applications that require large amounts of Raspberry Pi resources (e.g. real-time image processing) are now enabled since USB capture devices are not required. This page was last edited on 24 April 2018, at 03:34.